​“…There is no one righteous, not even one” (Romans 3:10). ​It is one of the hardest things for the natural human mind to comprehend that our own righteousness is not righteous enough for God. Humanly, we reason that if we do “good deeds,” they are “good” and “righteous” – why would that not be good enough? “Therefore no one will be declared righteous in God’s sight by the works of the law; rather, through the law we become conscious of our sin. But now apart from the law the righteousness of God has been made known, to which the Law and the Prophets testify. This righteousness is given through faith in Jesus Christ to all who believe” (Romans 3:20-22). If that were not clear, that God does not accept human righteousness as good enough, Paul drives the point home a few chapters later: “Since they did not know the righteousness of God and sought to establish their own, they did not submit to God’s righteousness” (Romans 10:3). The Book of Isaiah shows that human righteousness – while it might seem good – may sometimes even be offensive to God: “… all our righteous acts are like filthy rags” (Isaiah 64:6). So why is it that our righteousness is not good enough, and what does that mean for our Christian lives and our efforts to obey God? The Bible indicates there are actually a number of reasons why human righteousness does not measure up to God’s perfect standard, and it is imperative that as Christians we understand them. Although there are more, we will look at four examples here that make the point. As early as the Bible’s story of the “First Family,” we find Cain and Abel both sacrificing to God, yet Cain’s sacrifice – his “good deed” – was not accepted: “…The Lord looked with favor on Abel and his offering, but on Cain and his offering he did not look with favor…” (Genesis 4:4-5). Genesis makes it clear that Cain’s offering was not of the right form, was not given as it should have been, but Cain was indignant and angry. He doubtless felt his good deed was as good as that of his brother, but God did not think so. Throughout the Old Testament we find many stories of right things being done the wrong way, and the fact that God was not pleased with this kind of human “righteousness.” In our own lives we may not exhibit right done the wrong way in such an extreme manner, but how many of us as parents, for example, always discipline our children perfectly? Humanly we may think that if actions and behavior are good, they are good at any time, but the story of ancient Israel’s failure in this area is instructive. When God commanded Israel to take the Promised Land, the people balked in fear (Deuteronomy 1:31-40). It was only when they saw that they would then be punished that they said “…We have sinned against the Lord. We will go up and fight, as the Lord our God commanded us” (Deuteronomy 1:41). So the Israelites armed themselves and went out to do as they had been commanded, but it was too late – God was not with them and they were defeated (vs. 43-45). Once again, examples such as this may seem extreme compared to our own lives, but how many of us have put off doing something we know we should do till we finally accepted it or were ready to do it? Good deeds or righteousness done when convenient, when we are ready to do them, when we see an advantage or no further disadvantage, is not righteousness at all. We can err in this way from one of two extremes. On the one hand we can do right but not sufficiently or without truly being committed to what we do. It is said of King Amaziah of ancient Israel that: “he did what was right in the eyes of the Lord, but not wholeheartedly” (2 Chronicles 25:2). Such unzealous “righteousness” is obviously lacking in God’s eyes, but we can also fail in this way by being overly zealous! We have only to look at the history of Christianity to see the many evidently sincere individuals who felt that prayer and study were good so they spent their whole lives in these activities, not realizing that this kind of focus on one’s own righteousness is not the kind of outgoing, giving and serving righteousness that God wants to see in our lives. The final reason we consider here is perhaps the most important of all. We see an example of the problem in the story of Ananias and Sapphira recorded in Acts 5 where this couple gave an amount to the Church as though it was the full amount they had received. Usually this story is viewed as an example of deception and lying to the Holy Spirit, which it is (Acts 5:7-8), but when we consider the underlying motivation involved in why Ananias and his wife did this, it is just as much an example of doing good to be seen by men – to be appreciated and approved by others. Jesus continually castigated the righteous Pharisees of his day for this same problem – doing good with an eye to being seen by others – saying “Everything they do is done for people to see” (Matthew 23:5) and warning his disciples: “"Be careful not to practice your righteousness in front of others to be seen by them. If you do, you will have no reward from your Father in heaven” (Matthew 6:1). Have we ever “given at the office” because it was expected or because we wanted to appear good? 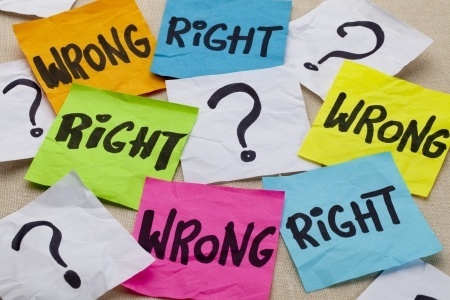 If we have done anything similar in our lives – if we have ever done anything thinking of an advantage or return from the act – we have discovered that we can, and often do, do right for the wrong reasons. The answer to the problem is found in understanding true righteousness. Romans 10:3 (“Since they did not know the righteousness of God and sought to establish their own”) and Philippians 3:9 (“… not having a righteousness of my own that comes from the law, but that which is through faith in Christ – the righteousness that comes from God on the basis of faith.”) make it clear that there really are two kinds of righteousness – ours and God's. Once we understand that our righteousness will never match the perfect, unstained righteousness of God, we come to see that just as God “imputes” Christ’s death to us for the forgiveness of sins, so He imputes Christ’s life of righteousness to us so that we then have access to Him. This is what Paul meant in writing: “Christ is the culmination of the law so that there may be righteousness for everyone who believes” (Romans 10:3-4). But the imputation of Christ’s righteousness to us goes beyond our standing with God and applies directly to our walking with Him. The apostle John tells us that “Whoever claims to live in him must live as Jesus did” (1 John 2:6 NIV), and the ESV translates this verse “whoever says he abides in him ought to walk in the same way in which he walked.” But if our righteousness cannot ever be good enough, how can we do that? The answer is that to the degree Christ is “in” us” (2 Corinthians 13:5), we will have the Spirit of God motivating and guiding our thoughts, words, and deeds (Ezekiel 36:26-27). It is through the Spirit of Christ and of God that the love of God that love – the chief “fruit of the Spirit” – flows through us and fulfills His law (Romans 13:10, Galatians 5:14). Every Christian must come to realize that our own righteousness can never match the perfect standard that God sets. Christ himself said “Why do you call me good? … No one is good--except God alone” (Mark 10:18). This truly puts things in perspective when we realize that even Christ’s righteousness was based on God’s power (John 5:19). The love of God that filled Christ enabled him to perfectly keep the law of God, and it can accomplish true righteousness in our lives as it did in the life of Christ. But in our walk with God we need to keep close enough to him to let that love be constantly present in our lives. New Christians sometimes ask me “How long should I pray?” and my answer is usually “until you are loving God and others to the full.” It’s not the answer they expect, but it’s the result we should be looking for. Only as we truly have the love God gives flowing through our lives do we have hope of true righteousness: “And hope does not put us to shame, because God's love has been poured out into our hearts through the Holy Spirit, who has been given to us” (Romans 5:5). It is to the degree that we are walking in His love that we find the Son of God does live in us and that through God’s help we are able to do right the right way, at the right time, to the right degree, and for the right reasons.